Back when I was reading LOTR in Russian, I remember fans arguing over the issue of whether Aragorn wore pants (or rather, using the British term, trousers), or not - what I later learned was a major topic of discussion in Soviet Tolkien fandom. The typical argument for "not" was that the book text never mentions pants. - this was an extremely fun topic for Soviet fans, because a decade earlier, the seminal Soviet SFF book "Monday Begins on Saturday" by Strugatsky Brothers made lighthearted fun of fiction books characters described by the writers as 'wearing a pair of slippers and a hat'. 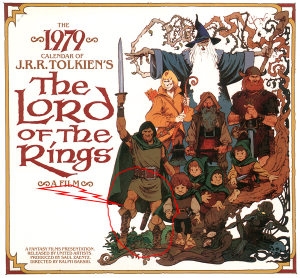 So, did Tolkien's Aragorn wear pants? It's hard to tell, but I'd be inclined to suggest he probably wore breeches, which are more like pants than like kilts. [M]ales, especially in northern parts such as the Shire, would wear breeches, whether hidden by a cloak or long mantle, or merely accompanied by a tunic. Considering Aragorn (and the Rangers generally) spend a fair portion of his time in the north, it seems reasonable to conclude that this statement would apply to him as well. But it's really only a guess. In terms of literary and historic background at least, it is fairly clear that Tolkien based most of the human races in Middle earth on Anglo-Saxon and Norse models. It is equally clear that the climate and geography of the areas that that story mostly covered are similar to northern Europe. It is hinted that the south of Gondor and the environs of Minas Tirith are a bit more Mediterranean but as the question is about Aragorn, his role as a ranger would tend to place his dress at the start of the books in a more northern mode. Most historical sources place the inhabitants of northern europe firmly in the trouser wearing or full length robe camp. 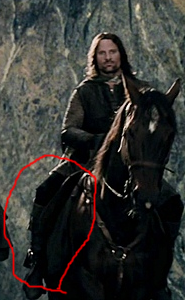 Given that Aragorn and companions hop onto horses and hike through swamps, trousers seem more likely. He opened the bundle. Frodo looked in disgust at the contents, but there was nothing for it: he had to put the things on, or go naked. There were long hairy breeches of some unclean beast-fell, and a tunic of dirty leather. He drew them on. . .' (my emphasis). This certainly gives us evidence in-narrative that trousers of some sort were known technology to the Hobbits at least. Consider that they are called 'breeches' rather than strange orcish leg coverings. This sort of implies that trousers of some sort were known. You also have to sort of assume that the 'born in the saddle' Rohirrim woud have worked out the advantages of trousers at some early stage in their domestication of horses. Apart from anything else simple common sense would suggest that anyone traveling in this sort of climate would opt for some sort of leg covering, call it breeches, hose, trousers, leggings or whatever. We also have to consider that Tolkien was writing in the early 20th century when the basic idea that active men wore trousers outdoors or some medieval equivalent as a matter of course and so it's not unreasonable to assume that any special middle earth deviation from this would have been noted if he thought it was important. ‘Dressed up like this, sir?’ said Sam. ‘Where are my clothes?’ He flung his circlet, belt, and rings on the grass, and looked round helplessly, as if he expected to find his cloak, jacket, and breeches, and other hobbit-garments lying somewhere to hand. ‘Very well, I will take it,’ said Frodo. Bilbo put it on him, and fastened Sting upon the glittering belt; and then Frodo put over the top his old weather-stained breeches, tunic, and jacket. They could all see him standing, waving one hand in the air, the other was in his trouser-pocket. "...I caught a glint of gold as he put something back in his trouser-pocket." But I found no uses of "pants", "chaps", "overalls", "pantaloons", "leggings" ... Tolkien really wasn't interested in clothing, I guess. Well... if we are to go with what Tolkien put in the books he is wearing a dark green cloak and boots.... oh and there is mention of a pipe and a sword at his side so that would mean a belt but otherwise no mention of any other clothing. Suddenly Frodo noticed that a strange--looking weather beaten man, sitting in the shadows near the wall, was also listening intently to the hobbit talk.He has a tall tankard in front of him, and was smoking a long stemmed pipe curiously carved. His legs were streched out before him, showing high boots of supple leather that fitted him well, but had seen much wear and were now caked with mud. A travel stained cloak of heavy green cloth was drawn close about him, and in spite of the heat of the room he wore a hood that overshadowed his face; but a the gleam of his eyes could be seen as he watched the hobbits. "As Frodo drew near he threw back his hood, showing a shaggy head of dark hair flecked with grey , and in a pale stern face a pair of keen grey eyes. You may meet a friend of mine on the Road: a Man, lean, dark, tall, by some called Strider. He stood up, and seemed suddenly to grow taller. In his eye gleamed a light. keen and commanding. Throwing back his cloak, he laid his hand on the hilt of a sword the had hung concealed by his side. Aragorn was the tallest of the Company, but Boromir, little less in height, was broader and heavier in build. Then Aragorn took the stone and pinned the brooch upon his breast, and those who saw him wondered; for they had not marked before how tall and kingly he stood, and it seemed to them that many years of toil had fallen from his shoulders. Maybe other will be able to come up with more quotes that may shed light of the clothing issue! However if you just think about it in a logical way he most probably wore breeches and a tunic as well as a vest of some sort. Probably in leather and heavy wool to keep warm. TL;DR: There is good reason to believe that he wore pants, and no reason to believe that he didn't. I searched all three books for relevant terms (e.g., pants, breeches, chaps, hose, leg, legging, knee, hip, waist, boot, sock, stocking, trousers, belt, pocket, pouch, leather, wool, linen, cloth, clout, etc), and picked out the ones that refer to Aragorn. Suddenly Frodo noticed that a strange-looking weather- beaten man, sitting in the shadows near the wall, was also listening intently to the hobbit-talk. He had a tall tankard in front of him, and was smoking a long-stemmed pipe curiously carved. His legs were stretched out before him, showing high boots of supple leather that fitted him well, but had seen much wear and were now caked with mud. A travel-stained cloak of heavy dark-green cloth was drawn close about him, and in spite of the heat of the room he wore a hood that overshadowed his face; but the gleam of his eyes could be seen as he watched the hobbits. The ground now became damp, and in places boggy and here and there they came upon pools, and wide stretches of reeds and rushes filled with the warbling of little hidden birds. They had to pick their way carefully to keep both dry-footed and on their proper course. At first they made fair progress, but as they went on, their passage became slower and more dangerous. The marshes were bewildering and treacherous, and there was no permanent trail even for Rangers to find through their shifting quagmires. The flies began to torment them, and the air was full of clouds of tiny midges that crept up their sleeves and breeches and into their hair. He [Aragorn] sat down on the ground, and taking the dagger-hilt laid it on his knees, and he sang over it a slow song in a strange tongue. Then setting it aside, he turned to Frodo and in a soft tone spoke words the others could not catch. From the pouch at his belt he drew out the long leaves of a plant. Aragorn had Anduril, but no other weapon, and he went forth clad only in rusty green and brown, as a Ranger in the wilderness. Frodo finds Legolas' meager footwear remarkable - wouldn't he comment on Aragorn not wearing pants? They were so deep in the doings of the Four Farthings that they did not notice the arrival of a man clad in dark green cloth. For many minutes he stood looking down at them with a smile. Elrond was there, and several others were seated in silence about him. Frodo saw Glorfindel and Glóin; and in a corner alone Strider was sitting, clad in his old travel-worn clothes again. Pants are an important part of "clothes"
The first part of their journey was hard and dreary, and Frodo remembered little of it, save the wind. For many sunless days an icy blast came from the Mountains in the east, and no garment seemed able to keep out its searching fingers. Though the Company was well clad, they seldom felt warm, either moving or at rest. Well clad people usually have pants on. ‘Here are some treasures that you let fall,’ said Aragorn. ‘You will be glad to have them back.’ He loosened his belt from under his cloak, and took from it the two sheathed knives. ‘Now let us take our ease here for a little!’ said Aragorn. ‘We will sit on the edge of ruin and talk, as Gandalf says, while he is busy elsewhere. I feel a weariness such as I have seldom felt before.’ He wrapped his grey cloak about him, hiding his mail-shirt, and stretched out his long legs. Then he lay back and sent from his lips a thin stream of smoke. For many hours they rode on through the meads and river- lands. Often the grass was so high that it reached above the knees of the riders, and their steeds seemed to be swimming in a grey-green sea. How does Gandalf end up on the roof of Orthanc in Isengard? How does Aragorn defeat the Wraiths on Weathertop so easily? Are Aragorn and Arwen cousins? Why does the Morgul blade dissolve after Aragorn touches it? Why does Sauron fear Aragorn if he is a Maia? Why does Tolkien not give Aragorn a duel? Does Galadriel wear any specific jewelry? Has Aragorn ever expressed fear?